The walled city of Dubrovnik was described by George Bernard Shaw as “paradise on earth”. The old city is a protected UNESCO World Heritage Site and is surrounded by spectacular fortified walls up to 25m high and 6m thick. Founded in the 7th century on a rocky island called Laus, it later became known as Ragusa. The Venetians gained control of the city at the beginning of the 13th century but, by the end of the 14th century, Dubrovnik had essentially become an independent city state and had established a lucrative trading position with the Ottoman Empire. In 1815 it was handed over to the Austrians by order of the Congress of Vienna and incorporated into the province of Dalmatia. Dubrovnik has a lot of tourist attractions, such as walls of Dubrovnik that represent the city’s main trademark. The walls run from four to six meters thick on the landward side but are much thinner on the seaward side.The system of turrets and towers were intended to protect the city. Another favorite tourist attraction are the Dubrovnik town gates. 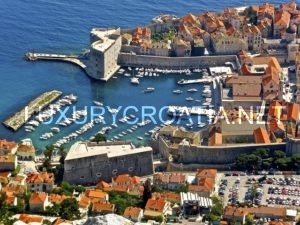 Dubrovnik town has four city gates: two that lead to the harbor and two that lead to the mainland. Another attraction that needs to be mentioned is the Lovrijenac Fort that is located on the west side of the Old City on a 37 metre-high rock. Lovrijenac is symbol of Dubrovniks survival and freedom, Above the entrance to the fort is the famed inscription: NON BENE PRO TOTO LIBERTAS VENDITUR AURO (Freedom is not sold for all gold in the world). And finally, the Placa or Stradun, main open-air public space of Dubrovnik, the favourite promenade and meeting place, the venue of all great festivities and processions, Stradun is the main shopping area and the widest and most beautiful street which divides the Old City into its northern and southern part. Its origins go back to the 11th century, when the people filled up the shallow sea channel which separated the one time Islet of Lave and a settlement on it from the land where another settlement existed. On the eastern part of Stradun there is The Large and lovely Onofrio Fountain. 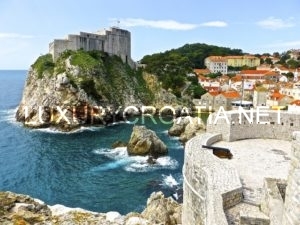 Dubrovnik is not only known for it’s historical and cultural aattractions or beautiful sea and beaches, but also as a filming location for manny movies and tv shows such as Game of thrones, Robin good, star wars and so on.